In 2066 we will be able to drink the 2007 vintage at the same age as we now drink the 1953. 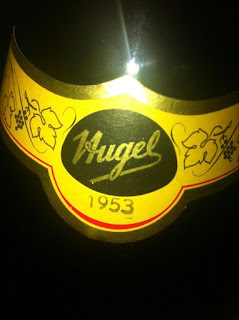 Unfortunately, there is only one single bottle left of the 1953 Riesling Jubilée Hugel. The third last was emptied in the company of Serge Dubs, the world's best sommelier. The second last of this stunning wine was drunk by the wine club Munskänkarna in Lund, Sweden in September 2012 at a tasting of old Hugel wines in the presence of Etienne Hugel. Thank you Etienne, thank you Hugel & Fils for what you do for Alsace and the regions' amazing, age-worthy wines! 2007 Riesling Jubilée Hugel from Hugel & Fils in Riquewihr is golden yellow with a youthful, greenish tint. On the nose it is dense with acacia, grapefruit, yellow apples, chocolate, bisquits and a hint bicycle tube. The taste is medium bodied, velvety and harmonious with sun-ripe, mature fruit and an acidity that is discrete at first but then evolves on the palate to frame a long and very promising aftertaste. Drink now and during the next half a century to come. Price (2012): €26.